Change UART settings of the Ethernet 102 (V2) Interface. The UART functionality in the Ethernet-102 (V2) Interface is a special option and only inplemented on customer request. The Ethernet-102 interfaces that support this functionality have an extra connector for the serial signals to interface. For the Ethernet-102 V2 Interface this UART functionality is a basic feature. 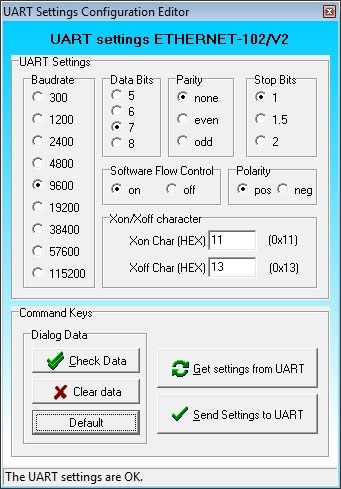 The program 'Brainbox_E102_ChangeRS232Settings.exe' is a simple tool that will give the software designers the possibility to change the UART communication settings of the Ethernet 102 Interface. The Ethernet 102 Interface must be connected to the PC-network and the power must be on. It is not permitted that there is already a connection made by an another program to the same Ethernet 102 Interface. Number of stop bits . The program start with a general screen. First a connection must be made to the Ethernet-102 (V2) Interface by pressing the 'Connect to Ethernet 102' button. In the TCP-IP connect screen the correct IP-address and port number of the Ethernet-102 (V2) Interface must be fill in. It is not necessary to fill in the default network address and port. After pressing the 'Connect' button the program try to find the network device by pinging this address. In this example the IP address of the Ethernet-102 (V2) Interface is: 10.0.0.170. By default the Ethernet-102 (V2) Interface is pre-programmed on IP-address 10.0.0.160. Press the 'RS-232 Settings' button of the general screen. The next dialog is shown. Before changing one or more serial network parameters, first the 'Get settings from UART' button must be pressed. The program loads the current UART settings from the connected Ethernet-102 (V2) Interface. Now change the parameters that are needed and send the new settings by pressing the 'Send settings to UART' button. The next parameters can be changed for the UART. Now the programming of the new settings are ready. The new settings become active after a power-cycle of the Ethernet-102 Interface. The Ethernet-102 V2 Interface will do a reset cycle. © 2012..2014 by BRAINTRONICS. All rights reserved.